The theme is water. Water unites us and in some cases it divides us. By taking part in the youth forum we crossed borders like rivers do. The intentions of group 2 was to go beyond lectures and ordinary exhibitions. The participants, who all of them have a more or less an artistic background met and got to know each other through activities. We used all of arts main disciplines; movement, dance, song, music, sound, words, still- and moving images, sculpture and actions. The main perspective was the human being, living with and out of water; expressions of emotions and spirituality, visualised through using water as a metaphor. Water seen from a scientific point of wiew was transformed into an artistic expression. Group 2, that consisted of twentyone persons were divided into smaller groups. The participants were able to choose group beforehand. I made some suggestions via internet, depending on their education and other skills. They were asked to prepare things at home that was used during the workshop and in the performance. Together we gradually elaborated the collective perfomance and exhibition, containing many different kinds of artistic expressions, all describing water in different dimensions; feelings and traditions of the different cultures of the euro-med region. 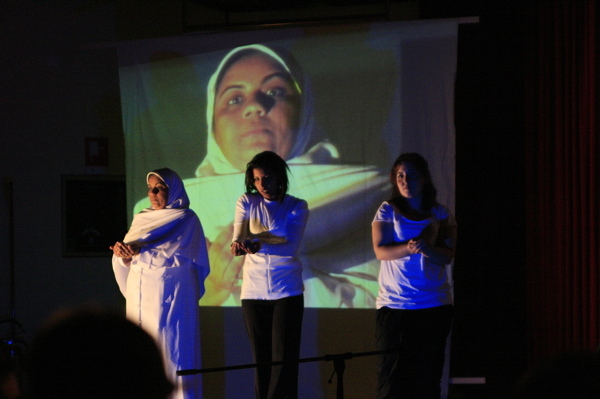 The performance was presented to the public at ACT theatre in Turin on the last day of the Youth Forum. It was a success! During the workshop the participants exchanged ideas that might lead to future cooperations. Each participant was given the opportunity to present their research (maximum 3 min) and these will also be published on the online forum on internet.